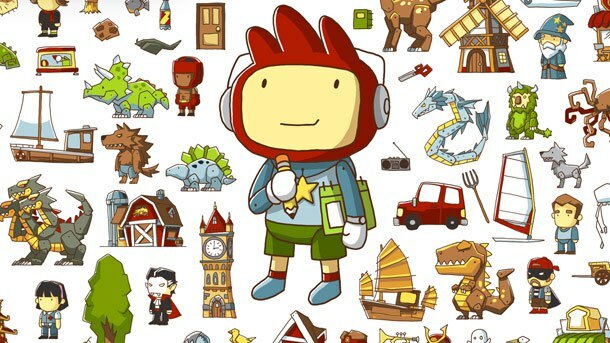 Along with the rest of the world, the potential of Scribblenauts blew our tiny little minds. Unfortunately, the first game had some control issues and we never picked up the second one. However, we spotted a copy of Super Scribblenauts new for less than the price of a pint. This must be the long tail effect then yeah? a 91% price cut over two years is how the games industry maintains healthy profits beyond launch week. Surely. That's why the games industry seems to be weathering the recession and why development companies aren't shutting down left right and centre. Right? Moronic business models aside, it benefits us well and we finally got around to the wonderful world of words. Why isn't this game in every classroom? Why isn't the media full of positive stories of gamers expanding their vocabulary through playing this lovely little game? We're almost done with the challenges in the game and, like everyone who reviewed it back in 2010, Super Scribblenauts really highlights how we have absolutely no imagination any more. TV and games killed our imagination. There needs to be a word to describe that certain feeling, like when you've got time to kill and the Internet at your fingertips, more information than has ever been available to any of the great thinkers who shaped society, and within an hour you've ended up on Wookiepedia reading the pages and pages about Luke Skywalker's girlfriend and other pointless trivia. Super Scribblenauts gives us that exact same feeling. We can conjure up anything at all to help get through the challenges and within minutes we're struggling to think up alternative ways to navigate challenges without using a jet pack, light gun, crowbar and dirty space suit. Our failing of imagination isn't the game's fault, but the game does a great job of hammering this message home. The death of our imagination aside it's a beautiful game. We genuinely haven't laughed at a game for a long time until a Scribblenauts wizard conjured up a pedophobic bridal woodchipper. Well played 5th Cell, well played. This game is yet another DS game that's slowly swaying us towards declaring it to be the de facto greatest gaming platform (outside of PCs) of all time. If only the next generation of consoles could deliver half the diversity and innovation that the DS has, we'd be mildly interested in what next generation is poised to deliver.